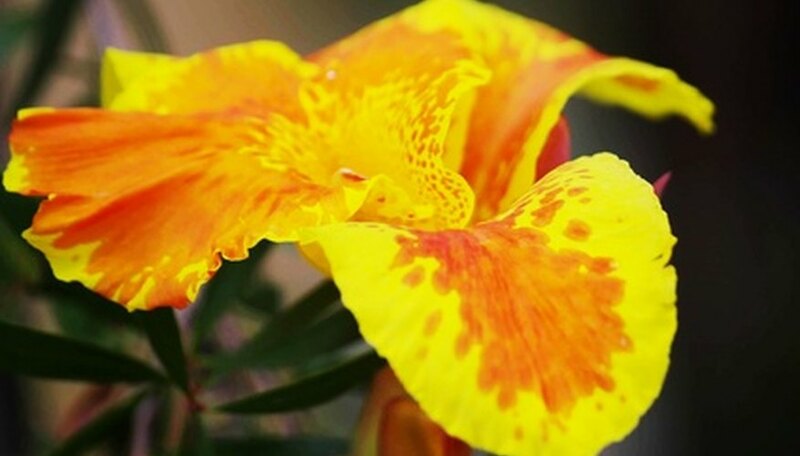 Canna lilies are tender bulbs that can’t survive brutal winters. As the weather begins to turn cold, the lush foliage yellows and signals that it’s time to dig the plants up for the winter. This typically occurs several days after a mild frost but prior to the first hard freeze of the year. Get your cannas out of the ground and into safe storage before they can be damaged by freezing ground. Cut the foliage back to about 3 or 4 inches tall. Use a gardening spade to loosen the soil all the way around and several inches away from the plant’s stems. Scoot the blade well under the clump to lift it from the ground. Turn the clump upside down to allow it to air dry for 2 or 3 hours. Shake the soil from the bulbs and rinse them well with water. Use a clean, sharp knife to cut bulbs apart to divide clumps, if you wish. Each division should have 2 or 3 eyes for successful growth. Discard any bulbs damaged while you were digging because these probably won’t grow. Place the canna bulbs in a dry spot indoors out of direct light for two days to dry completely. Move the bulbs to a warm, dry location out of drafts and direct light to cure for about three weeks. Pick a spot where they’ll be out of your way where it’s very warm, up to 85 degrees F.
Inspect the canna bulbs carefully. Discard any that are damaged, shriveled or diseased. Cut the remaining stems and foliage off of them. Treat the bulbs with powdered fungicide. Follow the packaging instructions carefully. Cover the bottom half of the inside of a cardboard box with storage medium such as peat moss, Vermiculite or sawdust. Arrange canna bulbs on the surface of the medium in a single layer so that they aren’t touching each other. Don’t pile any more bulbs on top of them. Write the date and the canna variety on the outside of the box. Store the box of canna bulbs in a cool, very dry location out of direct light. Optimum temperature for this is about 50 degrees F. Don’t allow the bulbs to freeze. Check on your stored cannas once or twice monthly throughout the winter. Discard any that are shriveled, shrunken or rotten. Remove any moldy packing medium as it occurs.